The lady reigning over Vic’s Bingo has been through several outfit changes over the years going from a retro look to more modern fashion. Along with her costume changes other improvements have popped up all over the site including more software than ever before and the mobile friendly design. Speaking of friendly, this site welcomes players from the USA and is a great choice for players. Digital Entertainment Services Ltd., licensed in Curacao, owns and operates the site along with its sisters Bingo Hall, Bingo for Money, Bingo Canada, Instant and South Beach. The software integration has expanded beyond Parlay and now includes additional US friendly providers. Slots are a favorite among bingo and casino players alike. Choose from top titles like Black Diamond, New Tales of Egypt, Diablo 13, Lady of the Moon, Firestorm 7, Pinocchio, Mad Orchestra, Get Crackin, Three Times the Riches, Event Horizon, Super 7’s, Diamond Surprise, Dwarven Gold, Wild Cherry and so many more. Additional games include Keno, Pull Tabs and Video Poker titles such as Jacks or Better, Joker Poker, Deuces Wild, Bonus Poker deluxe, All American, Deuces and Jokers, Tens or Better and Double Joker. Last but certainly not least is the bingo. Ticket prices vary from room to room and players may even hang out in the Nickels, Quarters, Dollar and free rooms. 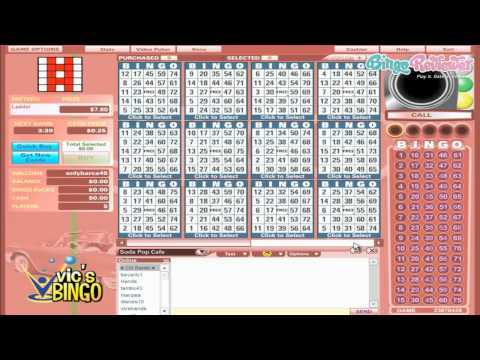 Pattern bingo is the game of choice in featured rooms including Fusion, Desperate Housewives, Crazy and several others. New players are welcomed with a No Deposit Bonus to explore the site plus a Welcome Bonus is waiting for you when you’re ready to make an initial deposit. A perk with this group is that players may have one account at all 6 brands. This means 6x the offers! The newsletter features creative promos every week and the Facebook page is home to the most exclusive tourneys, contests and bonuses. One aspect of the withdrawal process that must be pointed out is the withdrawal limitations. Each player is limited by their VIP status and the concept of cashing out is friendliest to those on the higher levels. We award Vic’s Bingo 3.5 Pink Hearts.